After earning only one win in their season opener against DePaul, the No. 17 Maroons came away with nine more after their weekend meet in Cedar Rapids, IA against Coe College. The South Siders went into the weekend knowing they had something to prove. Chicago made quick work of the No. 35 Kohawks. 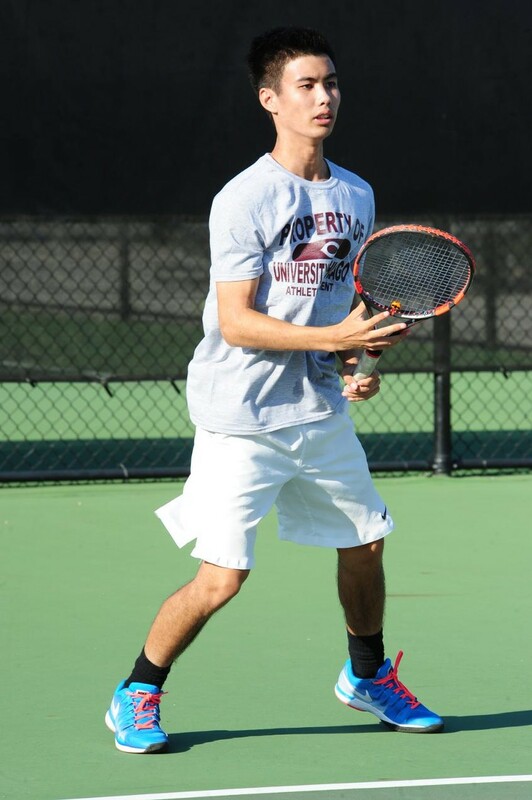 The squad won 9–0, and established itself as a force to be reckoned with in the DIII tennis realm. Five Maroons came away from the day with both singles and doubles victories. This win brings the team to 1–1 on the season, while the Kohawks will begin their season at 0–1 after their lopsided loss to the Maroons. Chua, who remains atop the national singles rankings, faced off against fourth-year Noah Sprinkle to get his first victory of the winter season. Sprinkle managed to take the match into a third set after dropping the first set 7–5, and winning the second set 4–6. There was never any doubt, however, as to who would be the ultimate winner, as Chua came away with a decisive 6–3 third set victory. “Obviously I wasn’t pleased with losing the second set, but I was confident that I could take the third. I knew I needed to stay focused and play more aggressive tennis in the third and I think I did a good job of that,” Chua said. At No. 3 singles, first-year Peter Leung also went into a third set, in his case against another first-year, Brady Anderson of Coe. Leung started the match off with a strong 6–2 first-set victory, followed by Anderson capturing the second set 4–6. Leung and Anderson battled it out until Leung was finally able to overcome Anderson in the third set by a score of 6–4. Sabada earned a victory in two sets at No. 2 singles and No. 1 doubles. Sabada and his partner, first-year David Liu, earned an 8–5 victory over their opponents to lead to Maroons double charge. The No. 2 and No. 3 doubles pairs followed suit, winning 8–5 and 8–2, respectively. “I felt confident towards the end of that first set and I think losing a close match the previous week against DePaul helped as I knew where I had failed and made sure to avoid those same mistakes this week against Coe,” Sabada said. At No. 4 singles, Liu defeated third-year Ryan Hickman 6–2, 6–4 while first-year Luke Tsai walked away with a 6–1, 6–2 victory at No. 5 singles, earning both rookies two wins on the day. Tsai is the only undefeated player the Maroons have, as he outlasted his DePaul opponent in the opening match earlier this season. With a solid win under their belt, the Maroons are feeling confident about their upcoming matches. The Maroons face No. 26 Denison, No. 8 Case Western Reserve, and No. 12 Kenyon this coming weekend, in one of the most challenging sequences the squad will face all year. “We have a lot to work on from these matches before our next matches and we’re going to need a good week of practice to be adequately prepared for this weekend and the season,” Chua said.